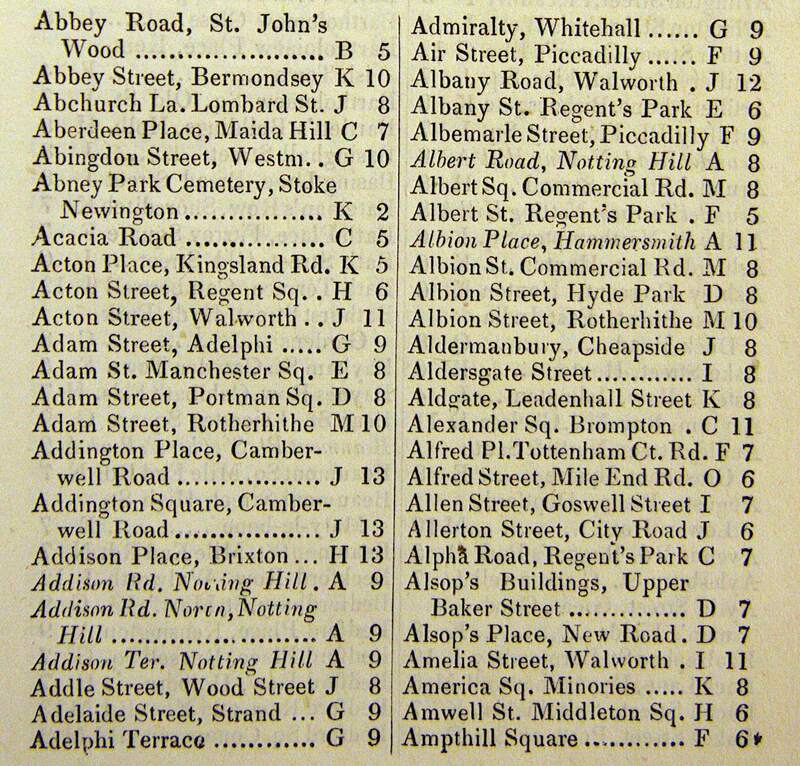 Running parallel to the development of fare books in the nineteenth century (like Mogg’s Ten Thousand Cab Fares) was the publication of what might be described as ‘at a glance’ information: that is, information contained on one sheet of paper in the form of comprehensive fare tables or maps. Books of fares, no matter how well designed, were clearly problematic to use, whether carried in a pocket or consulted in a cab: in a book format information could never be ascertained ‘at a glance’; pages had to be turned, indexes consulted, destinations and cab stands memorised. 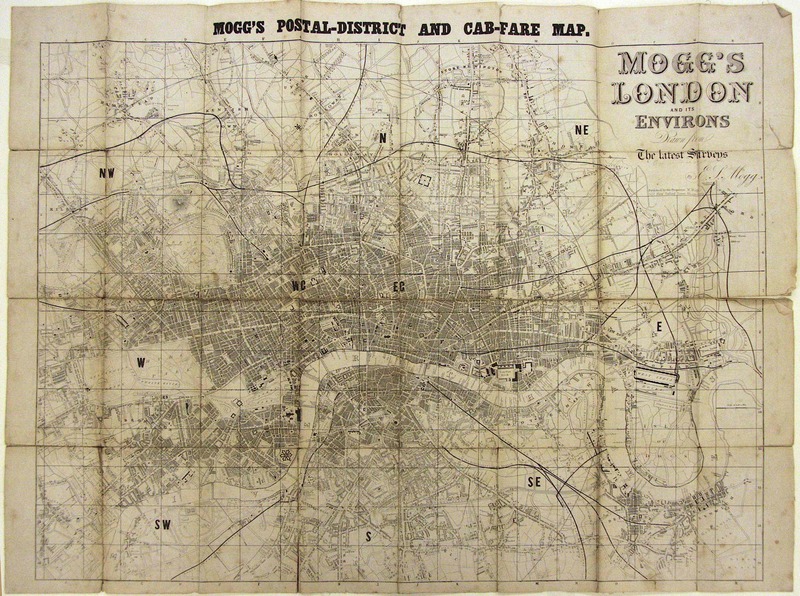 Mogg attempted to address this problem with his series of Postal-District and Cab-Fare maps (1 & 2), drawn by his brother Edward. Superimposed onto a conventional topographic map of London are grid squares at half-mile intervals, labels of the postal districts, and the four-mile radius from Charing Cross (shown as a dark circle) that marked the transition from a sixpence to a shilling fare per mile. In addition, referencing aids are included around the edges of the map: letters along the top and bottom; numbers on the sides. In the 33-page index that accompanied the map and listed 3,000 places, readers were instructed on how use the map (3): first, they were to locate their required destination in the index, and, second, to memorise the letter and figure of the square required (4). By then consulting the map and matching the letter and figure to those given around its edges, the user could find the required place ‘instantly’. Whether cab maps were indeed ‘useful’ to visitors to London is difficult to ascertain. 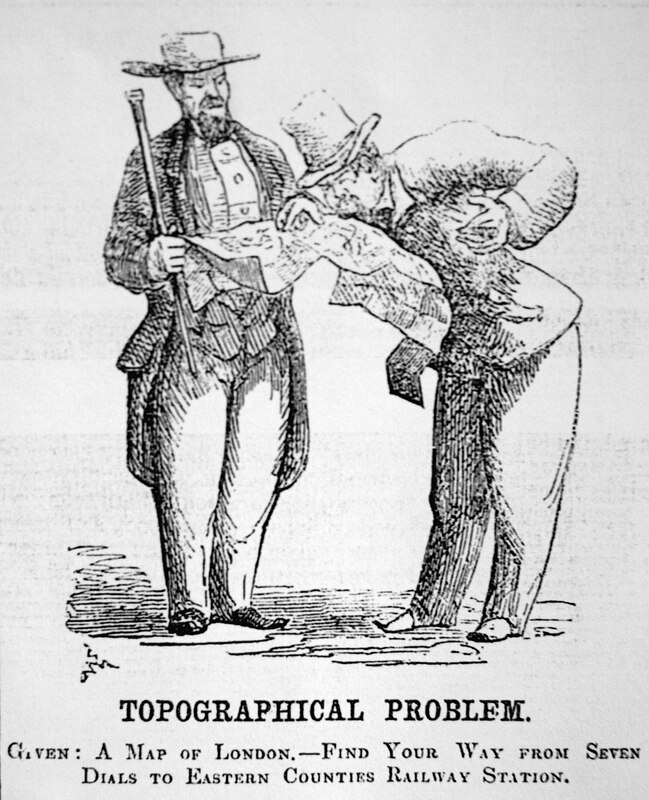 Punch, in 1851, provided its own satirical image of a map like Mogg’s being used (5). 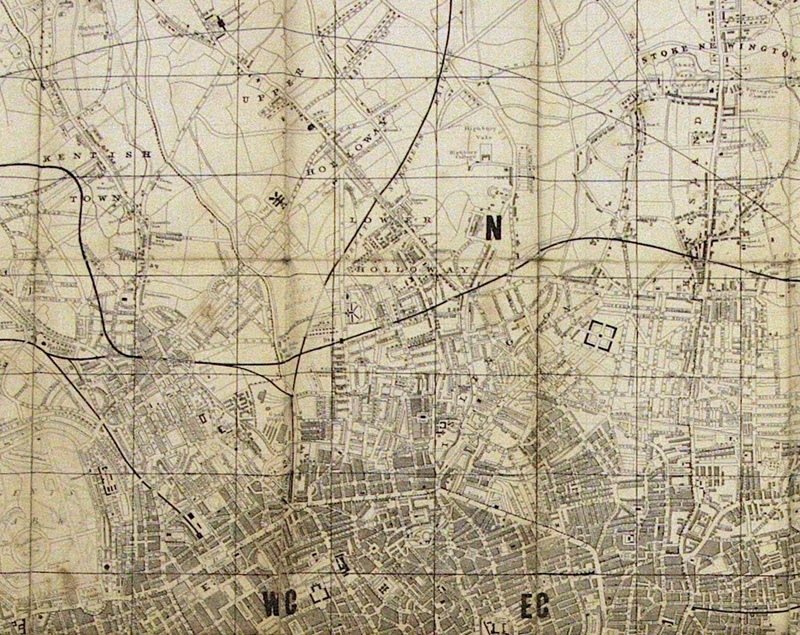 It showed two visitors to London engaged in a ‘topographic problem’, that is, trying to use a similar map to find their way from Seven Dials to the Eastern Counties Railway Station (now Liverpool Street), a distance of about 3 miles. With one visitor holding the map securely while the other squints up close at the obviously far too detailed map to try and measure the distance with his fingers, Punch mocks the optimistic claims publishers like Mogg generally made of their maps. Thanks Quintin. Glad you liked it. Am in London afternoon of 6 Feb if you happen to be around. Am doing a lecture at the Vic Soc in the evening. How’s things?